Let's make no bones about it: the headlining sport in the Winter Olympics is figure skating. No other sport comes close to the drama, the athletes, the subplots, and politics that figure skating has. 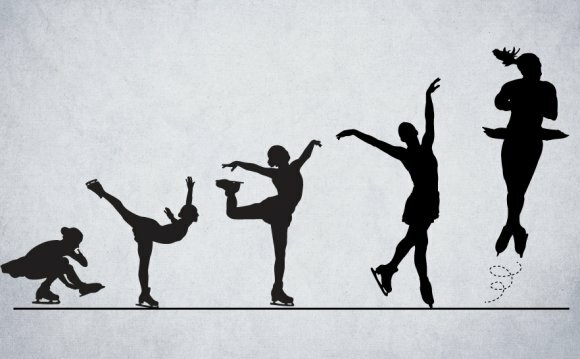 For skaters, all those hours, jumps and training are boiled down to around six or seven minutes. That's what makes the Olympics' skating competition so wonderful and so heartbreaking: skaters don't necessarily have to be the best, they just have to be the best for seven minutes (see: Lipinski, Tara). That's why we watch. For most of us though, the benchmark of a good skate is not falling (part of the reason people were surprised that Mirai Nagasu didn't make the Olympic team despite skating a clean program). To the untrained eye, a skater just transforms into a spinning blur for a few nanoseconds, and then lands (or doesn't) while we hold our breath. With the power of GIFs, we can now go beyond that to actually see these jumps — what makes the Axel so treacherous or the Lutz so difficult. And we can also tell these jumps apart. The six most common jumps in competitive figure skating can be divided into two categories: toe jumps — the toe loop, the flip, and the Lutz — and edge jumps — the Salchow, loop, and the Axel. The cool names like Salchow, Lutz, and Axel came from the skaters who invented them. "In toe jumps, the skater plants the toe-pick of his free leg and uses it to help launch him into the air. In edge jumps, the skater essentially just uses knee bend to launch, " Hacker told The Wire. The takeaway here is that you can start to tell the jumps apart by looking how the skater is taking off. Are they using a pick or an edge? By determining what they're doing (using the toe-pick vs. the knee bend), you can use the process of elimination to narrow down the kind of jump it might be to three. Further, the Axel is the only jump that begins with a forward approach. If someone is facing the jump head-on, you're watching the Axel. The toe-pick is pretty easy to explain (easier if you've ever watched The Cutting Edge). You'll see a skater kick the front of their blade into the ice before a toe jump. "Edges" are a bit more difficult to comprehend for a person who's never figure skated before. Thankfully, Hacker has skated before and can explain. "The skating blade has a hollow and therefore two edges: the inside edge and the outside edge. If you stand with your feet parallel, the inside edges are on the inside facing each other, and the outside edges are on the outside, " Hacker said. "A skater uses these edges for everything — the edges are essentially what give the blade traction with the ice, " she said explaining that skaters are constantly switching between edges throughout a routine. Shifting between edges is as simple as taking a tiny lean or a bit of pressure to the outside or inside of your foot. So, right, there are two types of jumps. And we have some idea of what an edge is so we can tell them apart. The final component to the jumps and what differentiates a Salchow from a loop is the take off and landing. All jumps end with a skater landing on a back outside edge (in skating right-handed skaters usually land on their right foot, jump and spin counter-clockwise, while left-handed skaters land on their left and so on). What sets these jumps apart from one another is how they start. This toe-pick assisted jump starts from the back outside edge and lands on the back outside edge of the same foot (if you're right handed, this is taking off from the right foot and landing your right foot). The toe loop above belongs to Russian skater Maxim Kovtun. If you look at the Salchow that Shizuka Arakawa is performing and scroll up to see Kovtun, you can see the massive difference between an edge jump and a toe jump. The Salchow starts from the back inside edge (if you were standing straight up, the edges that face each other) and lands on the back outside edge of the opposite foot (if you were right-handed, you'd take off from your left and land on your right). The loop is another edge jump, where the jumper (in this case, Johnny Weir) takes off from his back outside edge and lands on the back outside edge of the same leg. An easy way to remember this jump is that it's basically a toe loop without the assist of the toe pick. The flip like the toe-loop, is a pick-assisted jump. The difference between the flip, the toe-loop, and the Lutz is that the take off begins from the back inside edge and is landed with the opposite foot. The only difference between a Lutz and a flip is the edge the skater is taking off from. Some skaters "cheat" and take off from the wrong edge when attempting to do a Lutz, which calls for takeoff from the back outside edge and landing on the opposite foot. What also makes the Lutz difficult is that it's counter-rotated, meaning that the rotation of the jump is the opposite of its entry. The triple Lutz above belongs to 2010 olympic gold medalist Kim Yu-Na, whose strongest jump is her textbook Lutz. Here's a better look at Gracie Gold taking off from her outside edge.